When Rodney Lacroix was growing up, he wanted to be the world’s most romantic man. Actually, he wanted to be an astronaut, a fireman, an architect, and in his later years, an adult film star. After those attempts failed, he settled on becoming ridiculously romantic. And in this role, he has found success. 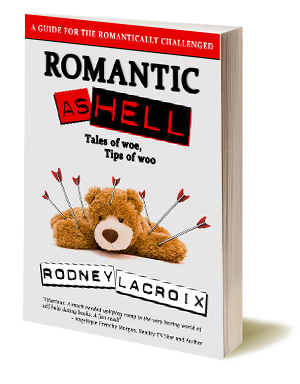 Written in his trademark style, Romantic As Hell shares inventive and creative ideas to help the lover in you. You’ll also find a bevy of pitfalls and blunders Rodney’s made along the way. So prepare to enter the world of Rodney Lacroix. Look around, get some ideas, learn some new tricks. But be careful. You don’t want to step in anything. Get your autographed copy from us.